The idea that English and French dress diverged because communications were disturbed due to the conflict between the two countries is very common. In actual fact, the fashion of this period did see lines drawn along national lines, but not out of necessity. Let's start at the beginning. Was there a distinct difference between English and French fashions during the period of the Napoleonic Wars (1803-1815)? A qualified yes. 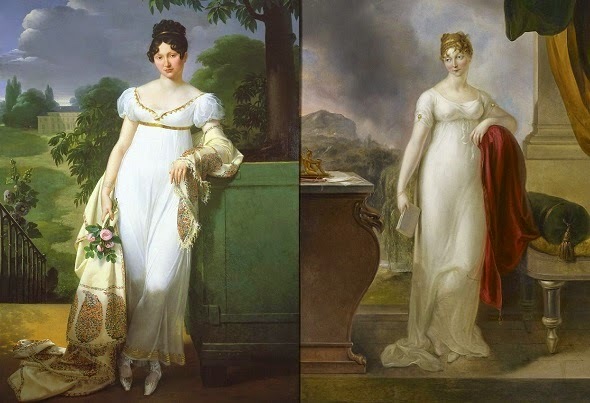 French (and American) fashion left the purely Neoclassical influence behind in the first few years of the new century. 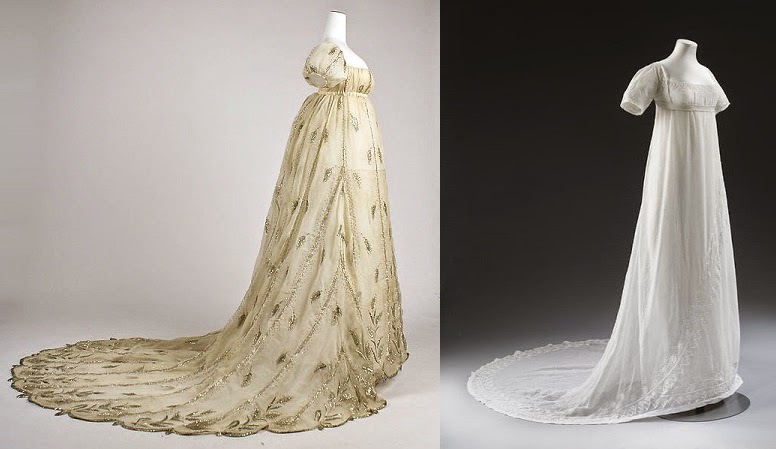 The train was dropped in morning dress, then in evening dress; full sleeves became common from 1804; slightly shorter skirts were cut to gather at the center of the back and stand away from the body at the ankle. More strictly-regimented curls imitated Renaissance and Baroque styles, not to mention Chinese ones. Meanwhile, English art and extant pieces show that the Greek sensibility persisted for some time, with fitted sleeves and long skirts. The train persisted in full and half dress until about 1814, but its impracticality made it disappear from ordinary dress around the same time that it did everywhere else. The trained skirts were often gored, but overall the desired silhouette in England had a narrow, clinging skirt with little or no flare at the hem: the morning dress shown in Patterns of Fashion I is a good example, with the center back closure that indicates its making in 1804 or later, but a straight-cut skirt with the fullness evenly distributed around it. Another, later evening dress in The Cut of Women's Clothes has only the slightest amount of shaping in the skirt, although the gathering is concentrated in the back panels. By 1812-1813, though, the two different traditions had mostly merged, or rather - English fashion plates, portraits, and actual dress bowed to pressure and began to conform to the styles that French and American women had been wearing, despite the continuing hostilities. This difference was not due to disturbed communications. Throughout the period of the wars, the British fashion press was well able to get hold of copies of French magazines like the Journal des Dames et des Modes. French plates would be reproduced, sometimes as "Parisian Evening Dress", "Parisian Walking Dress", etc., and while some were reprinted in Britain almost a year later, others were shown just months after having been first printed in Paris. The difference was also limited. 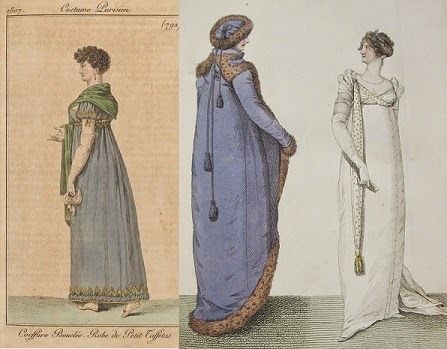 While the anti-French-fashion rhetoric detailed in The Failed Blockade: Sartorial Interchange during the Napoleonic Wars was very likely exaggerated in its outrage, it was also likely inspired by actual importation of fuller sleeves, shorter skirts, and Renaissance-inspired elements into Englishwomen's dress. Both La Belle Assemblée and Ackermann's Repository were in agreement on the matter, as were portraits of wealthy and influential women - retaining the styles internationally popular before war broke out was not only acceptable but preferable - but the actual fashion texts referenced France repeatedly (even in the title of La Belle Assemblée!) because that country was still seen as the home of fashion. Patriotism could be a persuasive force, but it couldn't completely overwhelm decades of tradition that France was to be looked to for fashion leadership. Thank you so much! I can't wait to see your toque. I find it interesting to learn that the divergence of English and French fashions during this period was NOT due to lack of communication between the countries, because I had always read that it was. Apparently, that is a myth that may never completely go away, despite the efforts of fashion historians to dispel it. Trains as long as the ones on the 1805 French and 1807 English gowns in those photos seem terribly impractical, even for formal occasions. I assume that women would almost always have pinned their trains up and out of the way for dancing, though. Jane Austen briefly describes Catherine and Isabella doing this in Northanger Abbey, and I would assume that it was a common practice. 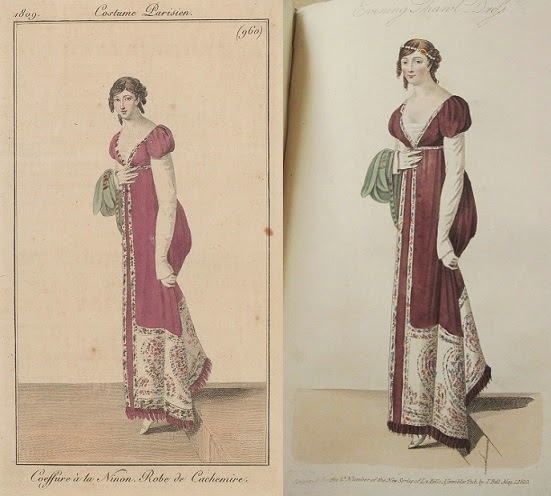 And that final pair of fashion plates -- so funny that not only is the gown copied, but the pose is as well. I think it's attractive because the dates do somewhat match up, people really like the idea of fashion being halted or slowed dramatically because of difficulty in corresponding, and it's a complex enough idea that it sounds well-informed. I subscribed to it until I started going through LBA and JDM page by page and realized that actual Parisian fashions were being shown alongside the English ones and that there must have been a deliberate choice involved. Finding The Failed Blockade was really helpful, too! What a well researched article! Love the comparison plates. I agree with Mimi - excellent research and the visuals really show the differences. Well done!